Cloud-based GIS from Esri helped the staff at Wall Street Network (WSN) keep producing online maps even after flooding from superstorm Sandy cut the power at the company’s offices at 110 Wall Street in New York City. Modeling and visualizing high winds can give risk managers a better idea of what may happen during and after a storm. Coincidentally—and fortunately—WSN, a technology solution provider based in New York City’s Financial District, had recently licensed ArcGIS and ArcGIS Online. The company uses the software to create solutions that help its clients – including risk managers in organizations such as insurance and financial service companies—analyze and effectively present vast amounts of data to better understand the risks associated with a catastrophe such as Sandy. Kristina Mazelis, chief operating officer and chief financial officer at WSN, learned about flooding near the WSN offices from Sandy in the early evening of October 29, 2012. She received a notification from her data center monitoring equipment, indicating that the offices’ backup power supplies had been activated. WSN’s engineers located in New York and Michigan were already equipped with all the tools they needed to remotely monitor and manage their systems as well as provide live end-user support over the Internet. ArcGIS Online, a cloud-based platform, was one of those tools. 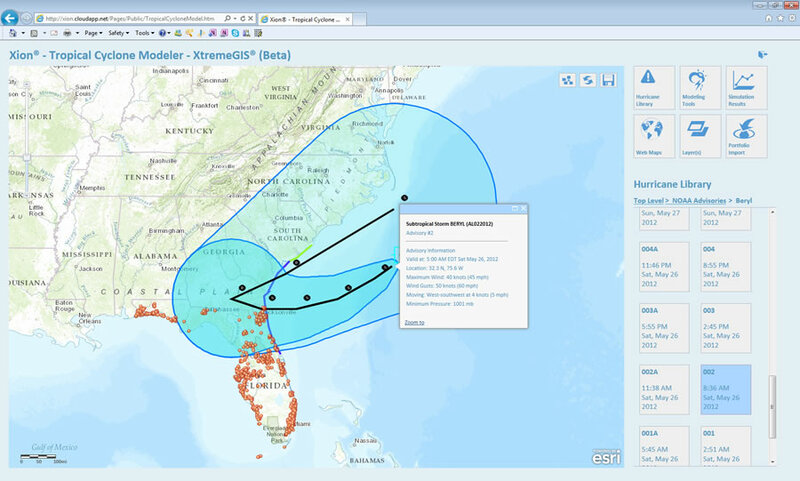 You can view real-time information via ArcGIS Online such as this advisory about Tropical Storm Beryl, which made landfall in Jacksonville Beach, Florida in May 2012. 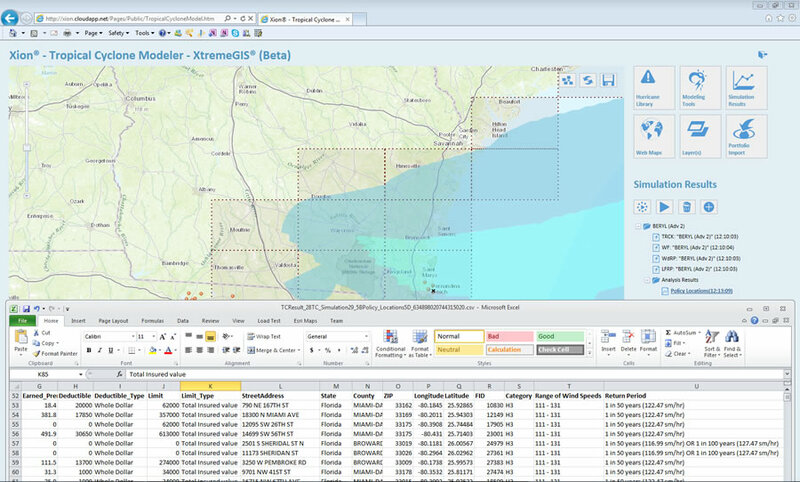 In what may now seem like a bit of foreshadowing, WSN decided months before the storm to create its first ArcGIS Online application for the insurance industry. “We chose this solution because we wanted to provide customers with tools to easily view and understand their policies by location to see how they are affected by perils just like superstorm Sandy,” Mazelis said. After a disaster like Sandy, insurance companies try to quickly create models that calculate its impact. With ArcGIS Online, WSN staff can help these companies understand their true risk instead of playing a guessing game. The highlighted geography shows the insured value loss estimates after Beryl made landfall. Geography traditionally plays a part in this process. Risk managers use a property’s location to judge how far away it is from a hazard such as a storm surge zone. 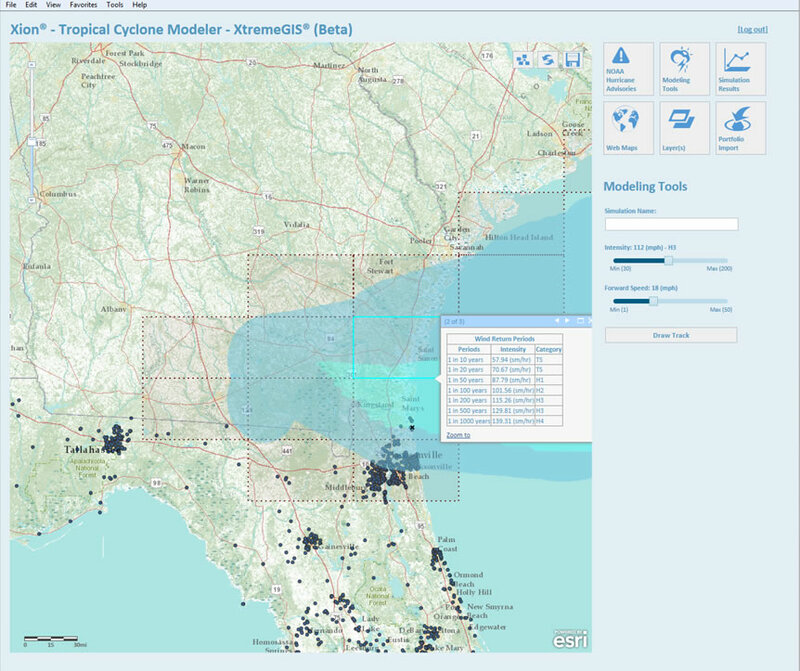 With the help of ArcGIS Online, WSN created a solution for risk managers to interactively view and discover updated spatial hazard inventory data to analyze information in real time. Depending on the catastrophe model created—a storm surge, for example—a hazard can be displayed on a map. The map can also include the locations of a client’s assets, so calculations can be made to determine the company’s exposure to risk before, during, and after a storm. WSN’s solution is changing the insurance industry from having to react in an ad hoc manner—for example, after a storm has occurred, asking what the damage was—to being constantly proactive. Hazards such as storms, political situations, and similar events can be monitored in real time. Ensuring that the monitoring systems in place are available—even when the provider is hit—is invaluable. As of this article’s publication, WSN’s telephones had not yet been rerouted due to the storm surge, and the company is not expecting to return to business as usual in its offices for another six months. Saltwater damage to building wiring—including electrical, data, security, and elevator systems—means that all wiring must be completely reengineered and replaced. This is the fate for thousands of businesses in New York City. In many places, fuel, oil, and wastewater inundation has made buildings uninhabitable. The City of New York is working with storm-impacted businesses by coordinating programs that provide temporary workspaces and free services and supplies. Businesses in need of these services can view a complete list of locations. For more information on how ArcGIS Online benefits business, visit esri.com/business.